Bob Jorgensen presents the first environmental scholarship at East Peoria High School to Hannah Schroer. Bob Jorgensen with East Peoria Green, www.eastpeoriagreen.com., presented the first environmental scholarship at East Peoria Community High School. EP GREEN is made up of citizens and city staff. The members try to help our local government be as green as possible. East Peoria High School Teacher and Hope Club sponsor, Mr. Hobbs joined the group about 5 years ago. Because of Mr. Hobbs, EP GREEN now had a connection to EPCHS’s Hope Club. Hearing about Hope Club activities and interests made us realize that EP GREEN needs to encourage environmental stewardship of the earth with the younger generation. Because of this it was decided to give a scholarship to an environmentally active member of Hope Club. 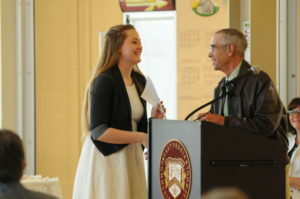 Hannah Schroer was the recipient of the award this year. She has been a member of the Hope Club for four years and the president for the last two years. Through Hope Club she has taken part in the EPCHS recycling program, the Clean Water Celebration, Green Carnival, and the promotion of refillable water bottles to replace one use plastic bottles. She has helped with some of EP GREEN’s events, like glass recycling. She has promoted environmental stewardship in her family, among her friends, and in the East Peoria Community. When she enrolls at Bradley University she plans to join the campus green club and keep growing in her mindfulness of ways to help our planet. East Peoria Green proudly awarded this $1000 Scholarship to Hannah Schoer. EP GREEN is looking forward to having Hope Club members of 2016 – 17 apply for the scholarship. Come and support your local farmers and producers. It’s an event you won’t want to miss. Shop while enjoying live entertainment. Stop by the Information Booth and register to win a free three month membership to EastSide Centre. WHEN: Every Friday June 3rd through September 30th from 3 to 6pm. There’s understandable tension between jobs and the environment in situations like switching from polluting, coal-fired power plants, fracking, and the Keystone XL pipeline. Changes can mean jobs lost – and also jobs gained. Some say it’s time for an effective transition program for workers displaced by innovation, and it’s an old idea that could also apply to a changing economy. The late, great labor leader Tony Mazzocchi of the old Oil, Chemical & Atomic Workers (now part of the Steelworkers) in the ’90s envisioned a program to help workers who lose jobs to otherwise-beneficial changes. Mazzocchi focused on changes from environmental improvement, but it could also address a more general economic objective. To provide a just transition for workers harmed by environmental policies, Mazzocchi proposed the idea of a “Superfund for workers.” The fund would provide financial support and educational opportunities for workers displaced by factors beyond their control. “There is a Superfund for dirt,” Mazzocchi said 23 years ago. “There ought to be one for workers. A broad-based workers’ Superfund could strengthen the hit-and-miss responses of the Trade Adjustment Assistance (TAA) program, which is supposed to help workers who lose jobs because of policies tied to NAFTA and other “free trade” pacts. TAA provides displaced workers an average of $10,000 over a two-year period, in addition to unemployment compensation, health coverage, etc. “A strategy has been emerging to protect workers and communities whose livelihoods may be threatened by climate-protection policies,” said author Jeremy Brecher (whose books include “Building Bridges: The Emerging Grassroots Alliance of Labor and Community” and “Common Sense for Hard Times”). “Protecting those who lose their jobs due to necessary environmental policies has often been referred to as a ‘just transition’,” he added. Whether tied to environmental innovations or corporations locating overseas, such a Superfund could be structured to provide for full wages and benefits for a transition period, possibly years; for years of schooling, including living expenses; and for decent pensions and health care for those near retirement age. Communities would benefit, too since they’re adversely affected by the individual casualties of job cuts. A decade ago, the federal government conducted a widespread closure of military bases, but that was accompanied by comprehensive government assistance to affected communities and individuals, again targeted to a specific, if widespread, phenomenon. Others could get similar attention – and have, at least in one non-military example. In the 1990s, the U.S. Department of Energy eliminated 47,700 contractor personnel at 13 major sites as a result of downsizing the nation’s nuclear weapons complex, Brecher wrote. Maybe something like that could work for Americans who lose their jobs because Caterpillar retrenches or Maytag or Oreo shifts work to Mexico.